Fun fact: Bicycles​ are considered vehicles in Pennsylvania. It's true! And with that designation, cyclists have most of the same rights and responsibilities as traditional motorists on our roadways. Biking is a healthy, accessible, and affordable mode of transportation. It offers a reduced environmental footprint with no fuel expenses or parking fees, low maintenance costs, and provides a cardiovascular workout. With these benefits, it's no wonder we're seeing more and more people choose to cycle on Pennsylvania's roads. We're also seeing more and more misconceptions about the rights of cyclists, as well as safety etiquette that cyclists should adhere to when sharing the road with motorists. The law when it comes to bicycles — or pedalcycles — on Pennsylvania roadways is outlined in Pennsylvania's Motor Vehicle Code (Title 75). Below are a few of the most common questions or concerns regarding bicycles and what is or is not permitted. "Bicycles are not or should not be allowed to ride on the road." "Why do cyclists insist on riding in the middle of the road? They should move over." "But cyclists are slower than other vehicles, and I'm in a no-pass zone. It's causing traffic to back up!" "Why don't cyclists just ride on the sidewalks?" "There's a large group of cyclists taking up the entire road; they need to ride single file." "When cyclists ride at night, I can't see them. It's not safe." "Am I allowed to cross into a bike lane when making a right turn at an intersection?" The Pennsylvania Motor Vehicle Code defines pedalcycles (bicycles) as vehicles and grants every person riding a bicycle the same rights as other vehicle, including the right to ride in the right-most travel lane or shoulder. They may also use the left lane when making a left turn. Bikes may use as much as the lane as needed for safety but should attempt to ride as far right as conditions permit so as not to impede traffic. Bikes may be ridden on the shoulder of the road (in the same direction as the flow of traffic), but are not required to do so. A number of exemptions exist that allow a bicycle to ride in the center or left portion of the travel, lane including the need to make a left turn, avoiding the "door zone" beside parked cars, or when overtaking a slower vehicle. There are many reasons a cyclist could choose to be riding in the center of a lane — usually for safety — and they are legally allowed to do so. If you encounter a cyclist you need to pass, you may do so (even crossing a double yellow line) as long as it is done so at a safe and prudent speed and you provide 4 feet of clearance between your vehicle and the bicycle. A bicycle is not allowed to ride on the sidewalk in a business district unless allowed by official traffic control devices (signing), nor are the allowed on the sidewalk when a usable bike lane has been provided adjacent to the sidewalk. Additionally, many municipalities have passed regulations banning bicycles from riding on the sidewalk. When riding at night, cyclists are required to use lights on the front and reflectors on the rear of bicycles that will be used on the roads. Reflective tape on helmets and the bicycle also can assist in visibility but are not required. Yes, Pennsylvania motor vehicle code requires turns be made from as close to the right-hand curb or edge of the road as practicable. To do this, the driver can safely and prudently cross into the bicycle lane, as long as he is not impeding on a biker's ability to travel in a straight line. A cyclist may occupy the lane while making a left-hand turn, and a motorist traveling in the same direction should not pass on the left of a biker trying to make a left turn. 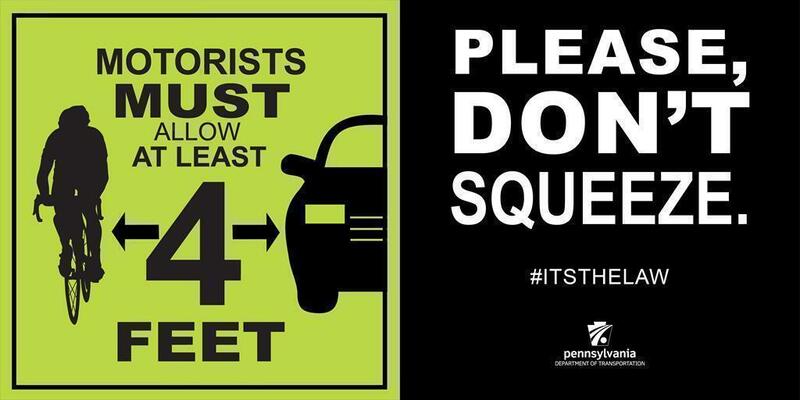 PennDOT provides a plethora of valuable information on the Ride a Bike section of its website, including statewide bike routes, bicycle safety information, and even information on using bikes on public transportation.